Researching your Scots-Irish genealogy is easier if you can identify your ancestors as Scots-Irish! The Scots-Irish put down early roots in Virginia, the Carolinas, and the Appalachian “backcountry” and would likely have come from Northern Ireland or Scotland. Read these important tips for tracing your Scots-Irish family history. 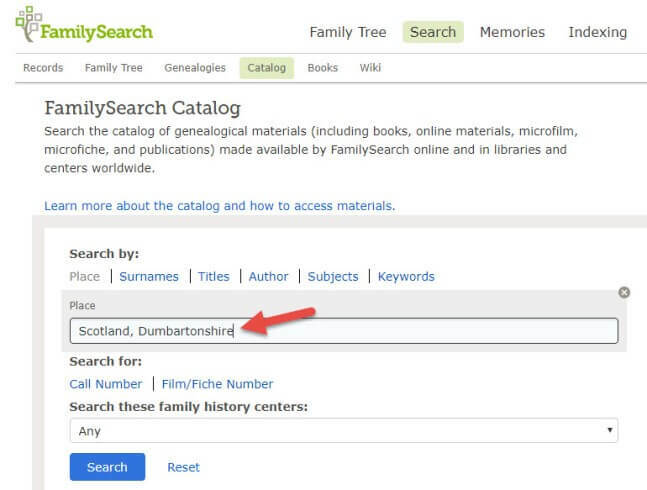 Thanks to Suzanne Earnshaw, Project Manager at Legacy Tree Genealogists, for providing this expert how-to article on tracing your Scots-Irish family history. Researchers use the term “Scots-Irish” to identify a people who went back and forth between Scotland and Ulster, Ireland. The North Channel, shown on the map below (click on it to see the original image), is also known as the Straits of Moyle. It connects the west coast of Scotland and the Mull of Galloway at the narrowest part the strait. There, the strait spans only 13 miles. This short distance between Northern Ireland ports and the western Scotland ports made trade and commuting quite common between Ireland and Scotland. 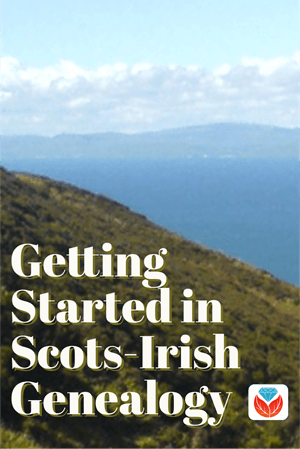 To find a Scots-Irish ancestor, start with what you do know. For example, my ancestors immigrated to America from Scotland in the 1880s. I traced my great-great-grandmother here in the US through US records, until I found a record which stated that she had emigrated from New Kilpatrick, Dunbartonshire, Scotland. Then, I began searching Scotland Census records in 1881 to find out more about my ancestors. Good research methodology includes finding your ancestors in each record possible to get an accurate picture of their life, and collecting data through which you can learn more about the previous generation. As I moved back in time through the Scottish censuses in 1871, 1861, 1851, and finally 1841, I found that some of these family members family on a record were born in Scotland and others were born in Ireland—my ancestors were Scots-Irish and moved fluidly back and forth between Ireland and Scotland. Based on this fact, I then knew to conduct research in records for both Scotland and Ireland to find additional family records. The free genealogy giant FamilySearch.org has a variety of records available, which are cataloged by collection. To learn what collections are available, go to familysearch.org, sign in for free (click here to learn how and why), click Search and then Catalog. Type in the place you would like to search for record collections. Records were often kept at a variety of government and church levels, and they might be cataloged differently. To properly research, type in “Scotland” and see what records are available. Then type in a narrower geographic area such as “Scotland, Dumbartonshire” and see which of those records might be of interest to you. The next search would be even more specific: “Scotland, Dumbartonshire, New Kilpatrick.” This increasingly-specific record search process can be done for any place. 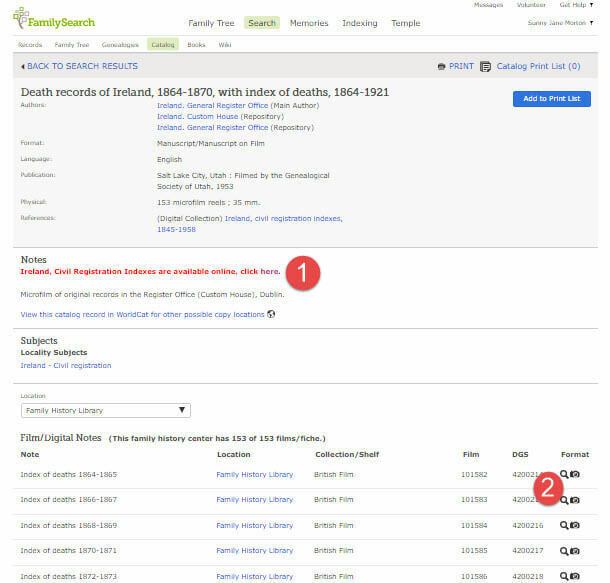 If you type “Ireland” into the FamilySearch catalog request, one of your choices is the collection Death records of Ireland, 1864-1870, with index of deaths, 1864-1921. Clicking on this collection takes you to the collection page. 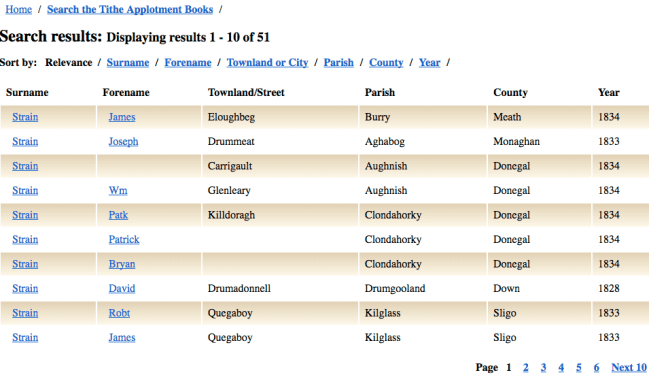 There is a note: “Ireland, Civil Registration Indexes are available online” (see #1 in the screenshot below). By selecting that option, you will be able to search an index of names that appear in “1864-1958 births, 1845-1958 marriages, and 1864-1958 deaths, but excluding index records for Northern Ireland after its creation in 1922.” Note that the index extends to 1958, further than the collection name indicates. Searching this index is a good first step, since it will provide you with the registration district if your ancestor is listed. Type in the name and identifying details. 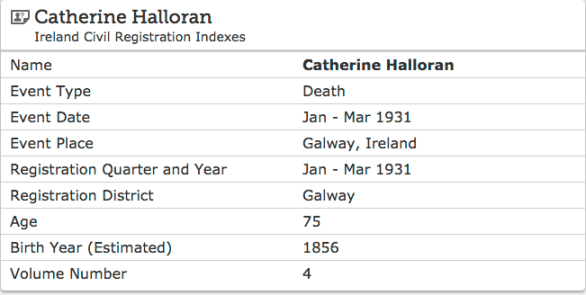 When I searched for “Catherine Halloran” Death 1900-1950, I found the birth that matched and it gave me the registration district as Galway. To view record images available in this collection, you’ll need to scroll down on the above catalog page. You’ll see the collection broken down into groups of records. Those with a camera icon on the far right (#2 above) have digital images on the site that you can browse through page by page. (Click here for instructions on browsing FamilySearch images.) Unfortunately, images of the original 1931 death records and the original index aren’t on the site; you’d only be able to look at original records through 1870 and the original index through 1921, as the collection name indicates. Irishgenealogy.ie. This website is free and home to the historic records of Births, Marriages, and Deaths of the General Register Office. Civil registration in Ireland began in 1864. Church records are also available on this website. Most on this website are for the Roman Catholic Church, but they do have some Presbyterian records as well. The Ulster Irish were mostly Protestant by faith, since many were originally English. The Scots mostly worshiped as Presbyterians (a type of Protestantism). Knowing your ancestor’s religion might be a clue to which records to begin research. AskAboutIreland.ie. This website can help you research your family pre-census. The Primary Valuation was the first full-scale valuation of property in Ireland. It was overseen by Richard Griffith and published between 1847 and 1864. To find your family, enter their surname in the search box. If you know the county you can put in that as well to limit the amount of records returned. Tip: Searching without the location can give you an understanding of the distribution of a surname at the time the valuation was taken. Tithe Applotment Survey at NationalArchives.ie. This site has the Tithe Applotment Survey of 1823-1938 for the 26 counties of the Republic. ScotlandsPeople.gov.uk. For information on how to search Scottish records on this official website for searching government records and archives, click here. Here is my final tip: as you research your Scots-Irish ancestors be sure to thoroughly search record collections by looking for a variety of spellings, using wildcards in your search terms, and reviewing original records page by page when you don’t find them in indexes. Legacy Tree Genealogists is a worldwide genealogy research firm with extensive expertise in breaking through genealogy brick walls. To learn more about Legacy Tree services and its research team, visit https://www.legacytree.com. EXCLUSIVE OFFER for Genealogy Gems readers! 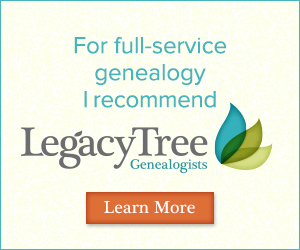 Receive $100 off a 20-hour+ research project from Legacy Tree Genealogists with code GGP100. Disclosure: This article contains offers with affiliate links, which may expire without notice. Genealogy Gems will be compensated if you make a purchase after clicking on these links (at no additional cost to you). Thank you for supporting Genealogy Gems! Everything here seems to be for the 1800s. My husband’s 2nd great grandfather Thomas McDowell was born about 1775, apparently fought the British during the Irish Revolution from the Antrim area, and escaped the area when the British successfully put down the Revolt, fleeing for his life. He eventually wound up in Virginia and we can track him from there. He married at least twice, with children from both these wives, and died, we think, in Missouri about 1841. But we have no resources to learn of his parentage, birth, and early life. What resources are there for 1700s research? Hi Phyllis, Thanks for your question! Because he died in the U.S., I would definitely start with any U.S. records that may mention his specific place of birth. That far back, I’d start with wills, published family histories, records about his children (including their baptismal records), and any additional church records (I’d ask an expert local to Virginia about church records for his area–even if he didn’t share the faith of the established church there, he may be mentioned in its records.) Suzanne from Legacy Tree sent this additional response relating to Irish records: “There are very few Ireland records that early, but there are some. You can look for Land Transactions including Deeds, Conveyances, and Wills that date back to 1708 in Antrim. We have amazing Ireland researchers if you would like our help.” (If you do want their help, check out the coupon code above.) Best of luck finding your husband’s Irish ancestors! Like wise, I need earlier records. My James Harper and wife Elizabeth Black, Presbyterians from County Tyrone, came to NY in 1812. I’ve been told I need to know the Parish in that county.